Clay Pike, President/CEO: So this is the mysterious Parker back room. People often ask, you know, "Why we don't have a self-serve front of the store?" The reality is because we have so many items back here, we literally have tens of thousands of SKUs back here that are uniquely customized to individual schools and their exact needs. We have some things like a blue oxford, for example, or this Peter-Pan blouse that, you know, can just be worn without a logo; but, the majority of the product that we actually deal with is customized specifically for the school, to manage and to meet the school's branding expectations, and to help them better manage the student population. It's incredibly surprising how many different colors of blue there are in the world. If you buy pants from five or ten different places and wash them a few times, you will see there are a hundred different colors of blue. We have just a zillion different plaids, and all kinds from jumpers for the little bitty kids, to skirts for the big girls, and it's a wide range. So we have to be able to fit every child, and so we carry something of everything for every single child in here. So here in back we have all of our custom schools. Items we might pull slightly less often, so they're not as close to the front. But here's something, this is Clay Road Baptist School. 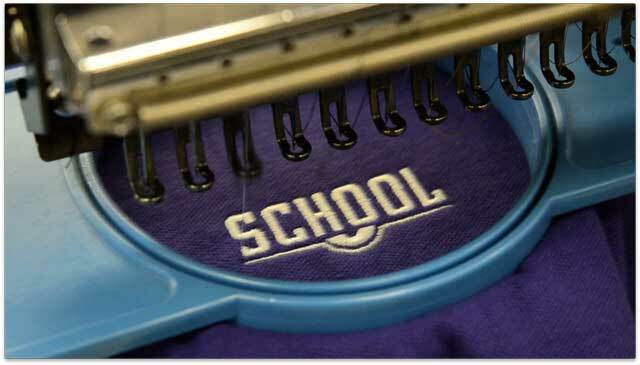 We're the only company in, you know, the school uniform industry, that pre-embroiders the vast majority of our goods. In fact, we keep almost two years supply on hand of many of these garments, so that when you walk in the store you get to walk out with merchandise. You can try on two or three sizes, see what you like, and carry it out the door. In many cases, other companies will have you buy the garment, then they will take it away and monogram it, and have you come back to pick it up. Another thing that we do, the reason we have so much inventory in stock, is that our commitment to our schools is that we will have it in stock, in your size, or we will ship it to your home for free. Again, we're the only company in the industry that has that guarantee. So we invest a lot in our inventory, we want to be sure that the schools get the service that they are expecting, and that the families are happy, and get to carry their merchandise home.